"Every capture is different and anything can happen," explains Mr. Kienzler. "We prefer to capture caribou in large flat open areas (such as frozen lakes) where the snow is deep. It is the safest situation for us and the caribou. This situation was ideal," explains Mr. Kienzler, referring to the picture. The most effective way to collect data and attach radio collars or satellite transmitters to the animals is to briefly catch them in a net. Scientists involved in the Porcupine Caribou Herd Satellite Collar Project try to maintain between 60 and 100 radio collars, and 10 to 15 satellite collars. To locate the animals, the scientists fly over the caribou winter range in a fixed-wing airplane to 'listen' for the radio collars' signals. 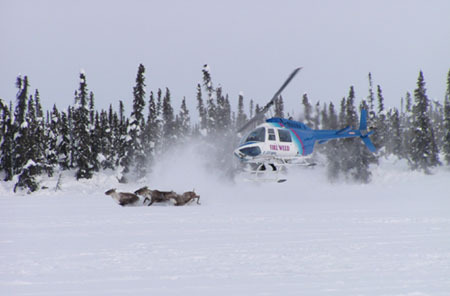 Once the caribou have been located, they then go out with the helicopter. Mr. Kienzler and his colleagues will set out for their next capture session during the week of March 13, 2007. While planning for their field work, they will use signals from the radio collars to identify where the majority of the herd is located. In addition to radio collars, twelve female (cow) caribou currently carry satellite transmitters. Signals of Spring students know that animals wearing satellite tags can be tracked from satellites way above the Earth's surface. Satellite transmitters allow scientists and Signals of Spring students to locate the cows from their computers. Satellite collars are much more convenient and easy to use; however they are very expensive so the researchers don't use as many of these tags. More cows than bulls (male caribou) carry radio collars and only cows are equipped with satellite transmitters. The collars are used to find the caribou each spring in order to keep track of the number of cows that successfully have calves. The bulls separate from the cows when it is time for calves to be born! Once the scientists identify the caribou that they are interested in capturing, the helicopter pilot tries to direct the group to a flat, open area that has deep, soft snow. 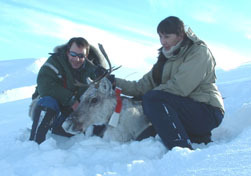 The team's major priority is the safety of the caribou and the scientists. Mr. Kienzler carefully aims the "net gun" to center on the caribou's shoulders and pulls the trigger. A 16-foot square net with weights on four corners flies from the gun and falls overtop of the animal. The caribou steps into the net and falls in the soft snow. Once the helicopter lands, three scientists begin their work. First, the scientists hold the animal down, blindfold it, and then remove the net. Then, the researchers can take blood samples and measurements and place the satellite transmitter or radio collar around the animals' neck. Cocoa is one of twelve caribou that currently carry satellite transmitters. She will be recaptured this March and her satellite transmitter will be replaced before the battery runs out. Cocoa has carried a satellite transmitter since 2004. Scientists will continue to track Cocoa to learn about the herds' migration patterns and use of the land. The Porcupine Caribou herd moves throughout 260,000 km2 of wilderness extending from Kaktovik, Alaska to Aklavik, NWT and south to Dawson City, Yukon. Porcupine Caribou were named for the Porcupine River that flows through their range. The caribou spend the winter in the southern portions of their range, but exactly where they winter varies from year to year. Sometime around April, depending on the snow and weather conditions, the herd begins to move north towards their calving grounds - the area where the cows will have their calves. The herd usually stays on the northern coastal plains of Alaska in the summer where they forage and bulk up for another winter. In mid-July, they begin their trip east towards the NWT and then eventually return south towards Dawson City. As the Porcupine Caribou migrate north to their wintering grounds, they cross Dempster Highway, a major landmark that snakes through the Artic wilderness. The number of caribou that cross the highway are a good indicator of how many animals will reach their calving grounds. Signals of Spring students can track the caribou as the move across the highway. 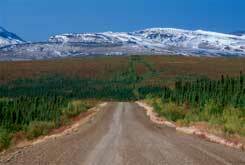 Dempster Highway is often closed for a week in the spring to allow caribou to cross the highway safely. As of 2001, there were about 123,000 animals in the Porcupine Caribou herd. The population has declined steadily since 1989, when the herd reached 178,000 animals. "Survival of adult female caribou is very important to population dynamics. Recent field research by the Arctic National Wildlife Refuge found that survival is lower now than it was when the herd was increasing," explains Ms. Cooley. This means the herd is probably still declining since 2001. There are lots of exciting things happening with the Porcupine Caribou. Keep your eye on the satellite tracking maps to investigate caribou migrations this season.